It also gives a second life to an appliance you may not be using much. In many kitchens the waffle iron is a sadly underused piece of equipment. “We go buy one thinking, ‘we’re making waffles on Sunday,’” says Senior Test Kitchen Editor Justin Chapple. “But then we don’t. And then we never do.” But just because you aren’t the waffle-making machine you thought you’d be is no reason to get rid of your waffle iron. Justin gives his a second life making omelets—Denver omelets, specifically. And he’s back with the newest episode of Mad Genius Tips to show you how to do it. The process is super easy—with no need to flip the omelet in a pan, it’s actually simpler than making one the traditional way. First coat the waffle iron with non-stick spray. You don’t want any egg bits getting caught on it. No one likes an omelet that’s full of holes. Then add ham, green peppers and red onions straight on to the waffle iron. Let them sizzle for a few minutes and then add beaten eggs. “[You want to] gradually drizzle it over the other ingredients,” Justin says. After your eggs are evenly distributed, let them cook with the iron open for about 30 seconds or until the eggs set around the edge of the waffle iron. The last cooking step might be the least intuitive. “Close the waffle iron, but don’t lock it. We want the steam to escape,” says Justin. That allows the eggs to puff up for a fluffy omelet. Finally, fill the omelet with cheddar cheese, fold it and plate it. The eggs should slide right off the waffle iron. 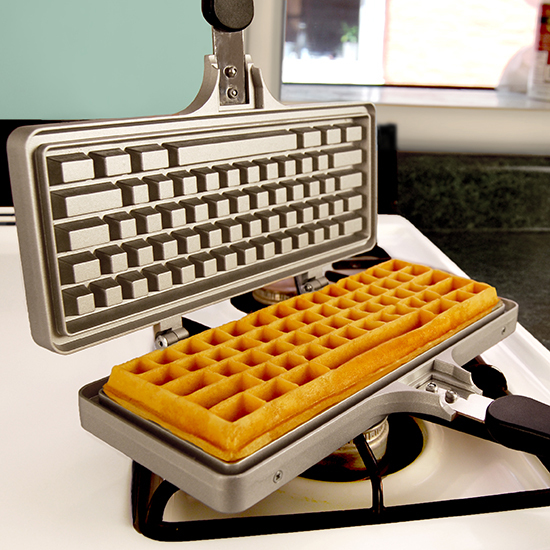 Making omelets is not the only way to multi-task with your waffle iron. You can also make excellent hash browns. Just don’t let that waffle iron sit untouched in your cabinet any longer. It gets lonely, you know. For more kitchen hacks, check out the rest of Food & Wine’s Mad Genius Tips.